0:00 When you make a recording its saved on your local computer. 0:03 By default these recordings are stored under your users Documents folder but you can organize recordings into separate folders by clicking the folder icon in the upper left corner to switch between folders you've used or Browse to select a new folder. 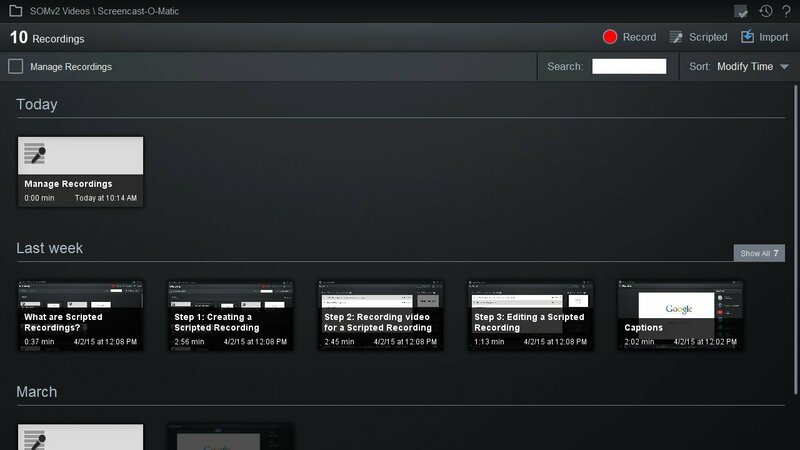 0:18 When you are viewing a folder you'll have options to create or import recordings to that folder and to search for recordings by name or adjust the sorting used to display the recordings. 0:30 For example this current view is sorted to show recordings based on when they where last modified which will put the most recently modified recordings at the top. 0:39 It will group recordings based on time as we see with this "Last Week" group. 0:45 If there are more recordings than will fix in the width of the window then it will collapse them and show a link here which you can click to expand that group. 0:54 You can manage the recordings in this current folder by clicking on the "Manage Recordings" box. 1:00 This will give you the option to Copy, Move, Export, or Delete recordings from this folder. 1:06 Export means to compress a recording into a .somrec file which you can then transport to another computer and use the Import option to import that recording. 1:17 To perform one of these actions you'd first select the recordings to operate on by clicking the recordings then clicking an action button. 1:25 For example if we click this recording then click the copy button we'll get a list of folders we've previously used or the option to Browse for another folder. 1:35 If I click to copy into this current folder then we'll see a new copy of this recording added to this folder. 1:41 If I wanted to delete that recording then I can click to Manage Recordings again, click that recording, then click the Delete button. 1:49 When you delete recoridngs they are marked for deletion but the actual delete doesn't happen unless you close the application or come up here and click this option which will let you either undelete or commit the delete right away. When you hover over the undelete you'll see a list of the deleted recordings so you can undelete a particular one or undelete all. When you hover over the Commit Deletes you'll see this flyout which you can then click to actually delete the recording files for those deleted recordings.